Computer music composer software as a source of musical inspiration and ideas. ...... in any way you want. The software has incorporated many musical themes - which could be listened - and the ones which could be used as a base for your own arrangement. Virtual Music Composer is based on computer generated music which is in category of royalty free music. This means that it can be used for further development, editing and distribution. Therefore, Virtual Music Composer represents a huge achievement to the music theory, or to be more precisely, to music composing theory. Musical themes developed by using this software are often used at public event, public, as theatre music, for exhibition, podcasting etc. 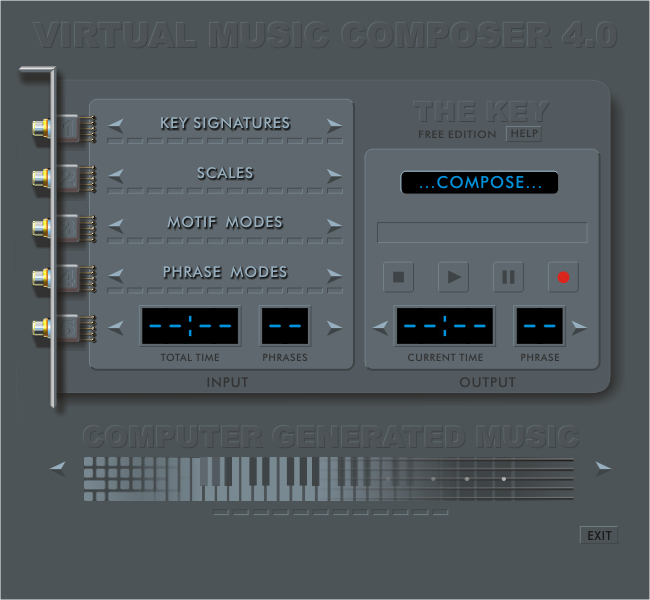 Virtual Music Composer 4.0 is extremely easy and simple to use. It doesn't matter what level of music skill or experience you have. Qweas is providing links to Virtual Music Composer 4.0 as a courtesy, and makes no representations regarding Virtual Music Composer or any other applications or any information related thereto. Any questions, complaints or claims regarding this application Virtual Music Composer 4.0 must be directed to the appropriate software vendor. You may click the publisher link of Virtual Music Composer on the top of this page to get more details about the vendor.